MJH Associates‚ Inc. (MJH) has acquired major market media assets from the UBM Life Sciences Group of Informa PLC. 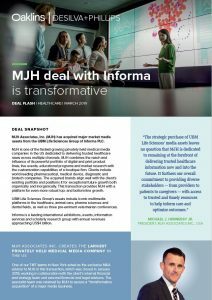 MJH is one of the fastest-growing privately held medical media companies in the US dedicated to delivering trusted healthcare news across multiple channels. MJH combines the reach and influence of its powerful portfolio of digital and print product lines, live events, educational programs and market research with the customization capabilities of a boutique firm. Clients include world-leading pharmaceutical, medical device, diagnostic and biotech companies. The acquired brands align well with the client’s existing portfolio and positions it for exceptional future growth both organically and inorganically. This transaction provides MJH with a platform for even more robust top and bottom-line growth. UBM Life Sciences Group’s assets include iconic multimedia platforms in the healthcare, animal care, pharma sciences and dental fields, as well as three pre-eminent veterinarian conferences. Informa is a leading international exhibitions, events, information services and scholarly research group with annual revenues approaching US$4 billion. MICHAEL J. HENNESSY JR., PRESIDENT, MJH ASSOCIATES INC.
Download the full deal flash by clicking here.